A Bifta in GTA V.
The Bürgerfahrzeug Bifta is a vehicle in Grand Theft Auto V and Grand Theft Auto Online, released as a special vehicle free of charge in the Beach Bum Update. 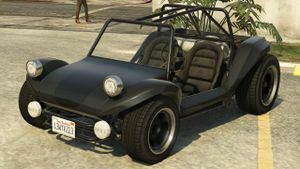 The Bifta is based off the Meyers Manx, and correspondingly takes over the dune buggy role formerly occupied by the BF Injection, also based on the Meyers Manx from GTA III to GTA Vice City Stories, in the 3D Universe. This page was last modified on 22 April 2014, at 17:54.